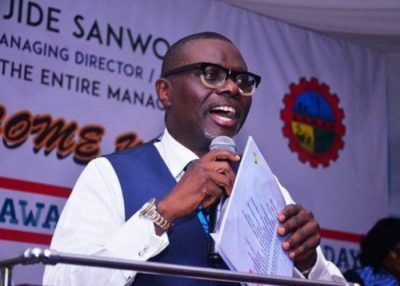 Babajide Sanwo-Olu, winner of the All Progressives Congress (APC) governorship primary election in Lagos state, says the fatherly role of Bola Tinubu, a former governor of the state, cannot be taken for granted. He said this while reacting to the primary which held across the state on Tuesday. The APC candidate also thanked leaders of the party at the state and national level, promising not to let them down. He said if elected governor, integrity would be his watchword. “Fellow Nigerians, I want to thank us, thank all of you for the numerous support I have received from everyone, I should seize this opportunity thank everyone. But first I need to thank the Almighty God who has kept all of us, Lagosians, Nigerians, up until this very moment; all glory, honour and adoration goes to the Almighty God. “I think it’s appropriate I thank our national leader, Asiwaju Bola Ahmed Tinubu, who has provided the platform for all of us, so many of us that have looked up to him, the fatherly role, a political landscape that one cannot take for granted. “I want to also use this opportunity to thank the national chairman of our great party, the All Progressives Congress, His Excellency Adams Oshiomhole and the national working committee for giving us tremendous support, for encouraging us and for letting true democracy reflect, for sustaining this direct primary and for letting it be the true test of what it should be. “In Lagos state, I think it is appropriate to thank the entire leadership of our party from the GAC, our numerous fathers, our uncles who have held on to this journey, who has demonstrated leadership to the highest level, who have demonstrated impeccable integrity at all levels, I think I owe them deep level of appreciation, I thank you. He also thanked Akinwunmi Ambode, governor of the state, wishing him all the best during the remaining part of his tenure. Ambode lost the ticket to Sanwo-Olu who polled 970,851 votes while he had 72,901 votes. Sanwo-Olu promised to run an inclusive government. “I think it’s also important to thank the executive governor of Lagos state, Mr Akinwunmi Ambode for a good fight. I wish him the best in the remainder of his tenure,” he said.